The Gobby Twins - Stand and Deliver! I had the pleasure of speaking to The Go-Betweens one gorgeous autumn in a Bondi Icebergs function room with a breathtaking view of the beach. Well, when I say ‘The Go-Betweens’, I mean Robert Forster and Grant McLennan (to whom I may collectively refer, at least in this introduction, as ‘The Gobby Twins’). Glenn Thompson, their current drummer, was also there and I did ask him a couple of cursory questions, but he graciously took his leave when he saw that I was far more interested in the lifetime members of the band. Having devoured David Nichols’s biography The Go-Betweens (published by Allen & Unwin in 1997, but no doubt revised since then) I had the good sense to select a ‘Modern Lovers’ t-shirt to wear to the interview. It clearly went down a treat, because Robert Forster ended the dialogue by telling me how “lovely” it was “to be interviewed by a man with a Modern Lovers t-shirt”. It’s that underground punk band thing that informed so much of The Go-Betweens’ early career, and still makes itself apparent, albeit less directly, in their work. At one stage McLennan tried to solicit my opinion on the cover art for the new album but I had the good sense to keep shtum. To me, it’s the kind of expressionist chiaroscuro of Weimar cinema. The foregrounded Forster, with the shaded eye sockets, is a zombie, McLennan, the controlling mad scientist. Well, I was there ostensibly to conduct a film interview for FilmInk, so I’m allowed to ‘read’ everything cinematically. But I’m glad I kept that particular cinematic insight to myself: after I’d unplugged the microphone, The Gobby Twins started to talk about journalists who had ‘done them wrong’ in the past, the name of one scribe in particular causing Forster to declare that McLennan would hold the guy, while he himself gave him “a bit of this!” The emphasised ‘this’ was accompanied by Forster busting kung fu moves not unlike those favoured by the jump-suited Elvis Presley of the 70s in performance mode. Having thus divulged this scenario online, I daresay that the next time it is enacted, the scribe who is held by McLennan and kung fu’d by Forster will bear my name. What follows is the cinema-heavy FilmInk article coupled with a version written up for the magazine Last, and the bits that don’t quite work are probably where segments of the different stories were grafted together. This version is dedicated to Fritz, AKA Anthony Frazer, who was interested enough to e-mail me and ask why I hadn’t yet uploaded this interview, and to Paul Davies, who was hip enough to own Go-Betweens albums and lend them to me when, whether I realised it or not, I really needed to hear their music. Despite the connotations, ‘journey’ perfectly describes the career trajectory that The Go-Betweens have traced. 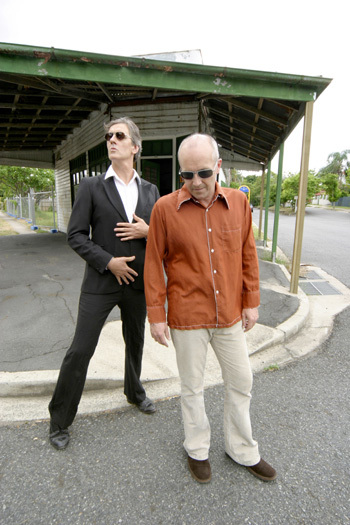 They came into being in 1978 in Brisbane, when Robert Forster approached his mate with the idea of forming a band. Hang on, I point out, doesn’t this mean that there wouldn’t be a time when The Go-Betweens’ back catalogue was reissued with alternative takes and flipsides? “Well, it’s already happened, man…” Grant begins, a little exasperated. Even if Grant McLennan sees his film years as lying ahead of him, at some level at least they have accompanied The Go-Betweens on their journey. The band’s first single ‘Lee Remick’ was named after the actress; their second album was called Before Hollywood; even the band’s name is a film title. 1970’s The Go-Between depicts a torrid, forbidden affair between characters played by Alan Bates and Julie Christie. Really, the only cinematic dimension missing from The Go-Betweens’ oeuvre is a film soundtrack. This is clearly false modesty. I reckon the real reason The Go-Betweens don’t get asked to do film soundtracks is because their songs are already so cinematic in and of themselves. The imagery of the lyrics and the sound-pictures painted by the music conjure better scenarios than anyone could provide. Consider the album’s lead single, ‘Here Comes A City’ – every line of lyric describes the image you’d film to illustrate it. It’s clearly going to be a very strong radio single, I tell the duo. I can already picture the video clip, I tell him. “What do you see?” McLennan demands. It’s a fast-moving, black-and-white clip with jump cuts and quick edits, as seen from a hurtling train, I tell him. “That’s the way I wanted to make it,” Grant McLennan says. “But you’re right, it’s black and white. And there are jump cuts. But the fast-moving stuff has all been done by the band. It’s very much a performance video.” He draws parallels to mid-60s New York: “…Andy Warhol, Gerard Malanga with the whip, all that sort of stuff…” Not quite a reference to The Go-Betweens’ earlier interest in New York punk, it turns out, rather a nod at Warhol’s experimental filmmaking: “beautiful people doing disgusting things to each other,” Grant explains. There is a pensive sadness to many of the lyrics, if not the actual music on Oceans Apart. ‘Darlinghurst Nights’ begins with “tears”, and even though another backward-looking song tells us with its very title that there’s ‘No Reason To Cry’, by its end, we are urged to “find a reason”. If, as it appears, Oceans Apart is the album with which The Go-Betweens look back upon themselves as a band, it’s worth noting the biggest difference between the ‘classic’ line-up and its current one. Lindy Morrison and Amanda Brown served not only as Robert Forster and Grant McLennan’s former musical partners; they were also their respective romantic partners. There’s clearly a different dynamic when lovers, or former lovers, are in your band. But is it a good or a bad dynamic, I find the courage to ask. 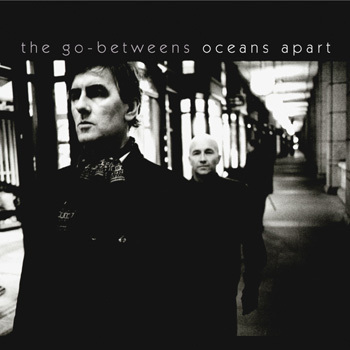 With Oceans Apart The Go-Betweens have managed to do that again.